An inventory mapping specifies the resources in Site Recovery Manager that a recovered virtual machine uses. Inventory mappings are optional, but highly recommended. If a virtual machine is not fully mapped, then it must be individually configured. To Explain this Scenario, I have created a VM > Powered On > Configured VM Replication > Added it in to Protection Group without configuring Inventory Mapping. Now as you can see in this below screenshot one warning is listed for the VM that is in Protection Group. 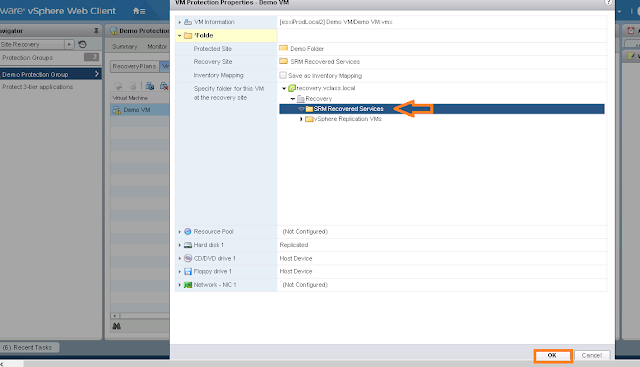 And the warning is "Mapping for the Folder, Network and Resource Pool is Missing"
Select VM in the Protection Group > Click on Configure Protection > You can notice for Folder, Resource Pool and Network mapping is not configured. To add this Individual VM mapping expand each category where it is shown as "not configured" One by one and map it to the correct location in recovery site > Click on Ok > Click on Restore Placeholder VM Icon. 0 Response to "Impact of Not Configuring the Inventory Mappings in VMware SRM"